Timepiece is a specialist clock shop set in the heart of old Dublin. Our shop is nestled between the two ancient cathedrals of Christchurch and St. Patrick's. Nos. 57 and 58 Patrick St. are home to the haven of horology that is Timepiece. We specialise in the field of Antiquarian Horology, with our main interest being in Irish horology. High vaulted ceilings, wooden floorboards and original cast iron fireplace, provide the backdrop to a most interesting collection of handcrafted timekeepers from the 18th and 19th centuries. Clocks of all shapes and sizes grace the floor and walls of the shop, each piece meticulously chosen. We have nurtured a thirty-year reputation for straight talking and excellent service. 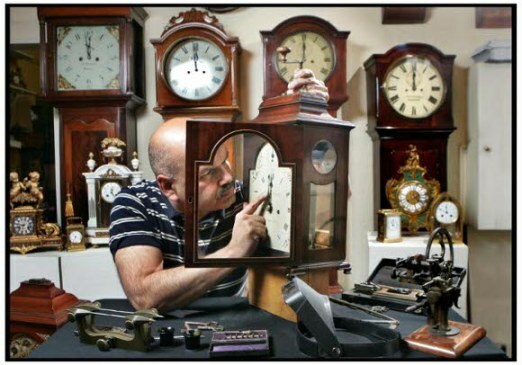 We take great pride in our stock and in the preservation of these old timepieces. We look forward to dealing with you and we hope you enjoy viewing our stock.